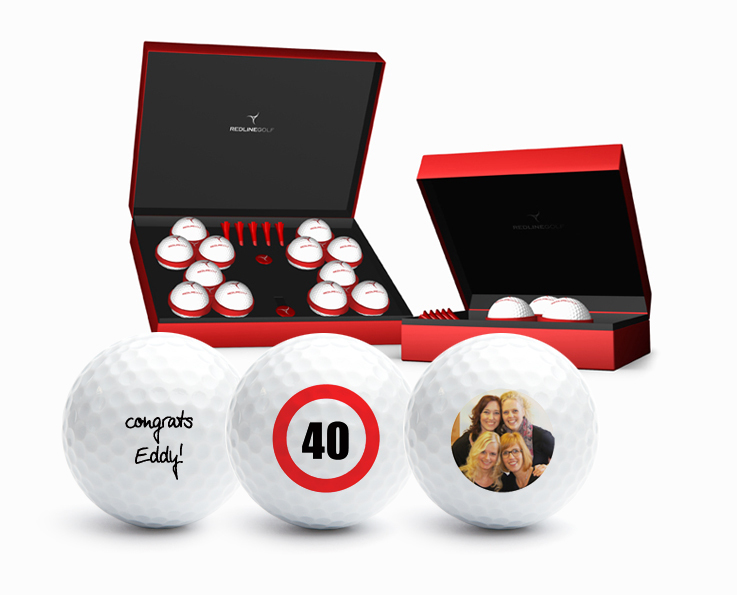 Personalise golf balls online and affordable in small quantities (starting at 3 balls in a golf gift box deluxe). We personalise golf balls through inkjet and special ink. This gives the print a longer lifetime. You can personalise golf balls in 4 steps and 2 minutes with our editor with text, photo or logo. NEW! Personalise golf balls per ball. You can personalise golf balls in our new editor per golf ball. This means you can tell your story on golf balls. Be creative! In step 4 of our golf ball editor, you can choose from more than 50 images and 7 themes in our image library: birthday, love, father’s day, mother’s day, flags, marriage and golf. You can print on both sides of the golf balls. Just add your text on the front and one of the images on the back. Prices starting at € 24,50 for golf gift boxes deluxe and € 1,50 per ball (60 balls and more). Print in full color: 21 mm print area. If your order before 15.00 PM, your order will be shipped the same day. Free delivery from € 60,-. Looking for a unique golf gift? In step 2 of the editor you can choose amagazing looking golf gift boxes, make your own custom theme box or make your own sleeves in small quantities (starting at 4). Personalise your golf balls in our editor in 5 steps. It’s easy to use and takes just 2 minutes. Questions or need help? Email us. NEW: personalise per golf ball! Tell your story or create a facebook on golf balls. If you search the internet, you will find many companies offering personalized golf balls. Before you buy personalised golf balls online, if will be wise to learn more about techniques, pricing, print quality and durability of the print. Which techniques is best to use? Which technique gives you the best print quality. What’s the lifetime of the print? What’s most affordable? The information below will help you to make the right decision. Pad printing is a technique that has been used over decades to personalise golf balls. This technique gives you the most sharp prints and biggest print area: 28 mm wide. In the video above, Titleist shows you how they pad print their golf balls in the factory. As we don’t offer pad print ourselves (we use UV print), we show you the video of our collegue brand. Pad printing needs one plate per color. Which means you need to pay for the plates plus pay a set up fee before you’ve even printed one golf ball. As pad printing needs a PMS color, you need to pay per color. Full color prints with an endless array of colors (like a photo) is very hard to print. A PMS color needs to be mixed per color. If your logo holds 3 colors, you need 3 plates which all need to be positioned in the pad printing machine. Keep in mind the pad print ink needs at least 2 to 3 days to cure, the delivery time will be longer. Mostly 7 to 14 days. Depends per brand or supplier. Besides delivery time you will need higher quantities to order: 144 or more. The lifetime of the print with pad printing can differ a lot between brands. The ink used with pad printing can react differently on each coating of a golf ball. That depends per brand. Most suppliers of personalised golf balls that use pad printing, print inhouse or outsource it with a third company. Your logo will be printed on the coating, not below. This means that it can be hit off easily. Best thing you can do before you order personalised golf balls is ask your supplier if your logo will be printed on top or below the clear coating of the golf ball. If it will be pad printed in the factory, your logo will be printed at the same time of the logo of the golf brand. This is by far the best way to personalize your golf balls. The lifetime of your logo will be 100 holes or more. This is the technique that has become very popular with logo golf ball suppliers over the last 8 years. You don’t need plates, no set up time, no PMS color to be mixed. Just print and ship. UV-inks are instantly cured by UV light. Which makes it the fastes way to personalise golf balls. It’s so easy, that 104 golf balls will be ready in 30 minutes: put the balls in a tray, align them, print and ship. UV printers print a primer, ink and a gloss coating to give the print a longer lifetime and a glossy look. Not all suppliers use gloss coating. That depends on the UV printer and the time a supplier wants to spend on printing your golf balls. Matt coated means no gloss, means less protection and a shorter lifetime of the print. Like with pad printing inks, there can be a big difference in the lifetime of the print. UV inks need to react on the clear coating of the golf ball. If the primer doesn’t react properly, the ink breaks easily. The clear coating of Redline golf balls have been optimized for our UV inks. Which means we can guarantee a long lifetime: 72 holes. Our state of the art editor enables you to print each golf balls individually. This way, you can add a photo on the front of each ball and a personal text on the back. Just try it out and start making your own personalized golf balls. With this technique we started personalising golf balls back in 2011. The difference between inkjet UV and inkjet is the ink and the way it dries. 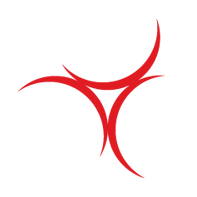 There are 2 types of ink with inkjet: SD ink (standard) and SP ink. SP ink ‘eats’ itself in the surface. Hence it stays on a golf ball longer. Like with inkjet UV a primer is used to get a longer lifetime of the print. But it still is a fragile way of golf ball printing, like pad printing. The prints holds 36 holes maximum.